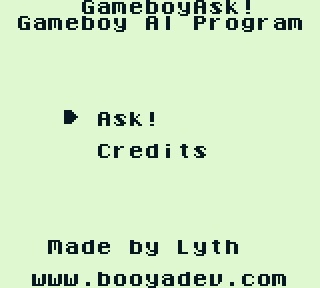 GameboyAsk! is a unique "game" for the Nintendo Gameboy, as it's not a game at all. It's a basic AI (Artificial Intelligence). The reason behind this, is to not push the Gameboy in technical levels, but to rather push to ideological levels behind developing for the Gameboy. Essentially, this is like a smart phone APP on an old "non-smart" device. The usage of it is quite simple. The user selects words from a list, and creates a logical sentence for the AI. If the sentence is non-logical, or outside of the scope, the AI will say so.